Part of the railing encroachment of The Joint. In the “Squeaky Wheel Gets the Grease” Department, the OB Rag has just been informed that because of concerns expressed by local OBceans on the encroachment into public space by The Joint restaurant on Newport Avenue, the City did a site inspection which resulted in the eatery’s owner being given a “correction notice”. 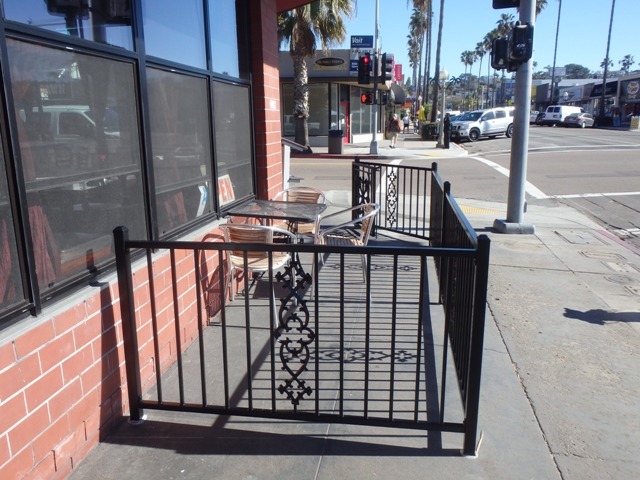 OBceans have for weeks been complaining to the City, via the OB Rag, through a poll we conducted, and through calls to Lorie Zapf’s office, that the recent installation of a gated outside railing by The Joint was encroaching too much into the space for the public sidewalk. Some thought it created a dangerous situation, especially on crowded days such as the weekly Farmers Market. Apparently, on Wednesday, April 6th, a site visit was performed by the City’s Development Services inspection team with the restaurant’s owner, Mr. Lowe, present. Measurements were taken and at least a few of them “were found to be inconsistent with the approved and community plans,” so stated an email from William Barrañón, Inspection Services Manager for the City of San Diego Development Services, to a concerned local. Locals had taken their own measurements over the previous weeks and discovered that the legally required distances between objects and the railings had not been met. And as a result of the errors determined by the site visit, the City’s final Inspection approval of the project was rescinded and made the permit (Approval #1340587) for the “improvements” active. Conrad Wear of Zapf’s office had assisted the OB citizens in their efforts to get the City to take some kind of corrective action into the encroachment by The Joint into public space. 1. Rescinding a final inspection approval is unheard of. 2. Measurements were inconsistent with the “approved and community plans?” If the measurements were not according to the approved plans, that makes sense and the City’s inspector is at fault for not ensuring the project was built per plans and specs. But, this doesn’t surprise me at all because not only do we not have enough money to fix our streets, we do not have nearly enough inspectors and stuff like this happens all the time. I’m not aware of any measurements in the Community Plan, I don’t get that comment. 3. An inspection “team” to look at this small issue? Very odd. And, once a project has a final, Code Enforcement takes over jurisdiction so why did the DSD show up? 4. But here is the kicker, the City said to “either revise the plans for the outdoor dining installation or have ‘the work corrected to match the approved plans.’” Which one do you think the owner will want to do, revise the plans or rebuild the rail? This is a classic City response. If you report an illegal garage conversion or something else, the City always offers to let an owner get a proper permit – after the fact – rather than tear out the improvements. I would advise those who spearheaded this effort to press the City to have the work redone, NOT the plans, or all will have been for naught. Agreed, “revising the plan” makes no sense without also revising the construction. You can draw plans until you’re red in the face, but those trees and planters aren’t moving. Could they really revise the plans to leave less than the required 5 feet? I’m afraid they could. If the deviation is not a big one, they will. I can’t remember how much less than the five feet the rail is but I seem to recall it was a matter of some inches. The City does not have the will to force the owner to rebuild it. The mere fact that they gave this as an alternative is a strong indication that this will happen. I hope not because some people have made a real effort to have this corrected. GP – good to have you on board to help with deciphering city moves, etc. It’s more than a few inches. And depending on how strict they are on the newport side, it could be more than a foot over the limit. But if you move the railing, at some point the patio becomes too narrow to be ADA accessible. Or you can remove parts of the railing, but then no alcohol can be served in those areas. Looking at the attachment, there is at least an 8″ violation, which is significant. But, that is what the citizen reported. Watch out for the City having less of a measurement because they measured it “properly” and allowing the deviation. If adjusting it will do what you have explained, the City will do everything it can to allow it to remain. And, this is a Code Enforcement document but the story says that the DSD inspection team looked at it. Doesn’t make sense, the responder should have been from Code Enforcement. Maybe the DSD is trying to make up for its inspector’s error somehow. I will repeat what I said earlier, keep an eye on the City. I understand how this happens when what gets drawn on paper doesn’t always quite match site conditions. It’s a shame the city did not do their job to begin with, it would have saved costs and headache. The city declined to investigate complaints while the permit was still open and the installation was in progress. Frankly I’m surprised they did at all, but better late then never I guess. Thank you fellow pedestrians for speaking up. kh, This is why I thought the whole response very odd, frankly, it smells of politics. Once the permit was closed, it should have been Code Enforcement that showed up. I’ve been told by the City, when I pointed out a project was wrong, that they disagreed and told me to call Code Enforcement – who will not come out on an active permit – if I was so sure. I did and Code Enforcement agreed with me. Yes, it is a shame that owners have to experience this additional cost and headache because the City isn’t doing its job. And I will join you on thanking the people who bird-dogged this. So, does this vindicate the OB Rag and all those complainin’ whiners? I think it does, all you doubting Thomases and Thomositas. See what the power of the citizen press can do? If you see something out of place, dangerous or incompatible with our lifestyles, tell the staff at the OB Rag. They usually respond. Not always, but usually. You can accomplish that without getting greedy and taking over more public sidewalk than is allowed. Maybe next time the city will sell off the public sidewalk or alley by your place for a few grand. I think a rental bike kiosk would look great right there. this sore spot on Newport! Ms.? My boss? Not Ms., and don’t work there. It looks so ugly & Cheap, like a jail, ugh. Slamming into me, no way. Just get rid of it. It looks so out of place anyway as its too small. You tried it, now tear it down. Just like Reagan said! The Joint wasn’t open in 1997. Wrong. There were 3 founders of the Joint- 2 of which (the Gladstone Brothers) have moved on a couple years ago. None of them worked at the previous restaurant that occupied that location. Not true. Not the same people at all. Sounds like the whole thing was poorly planned. I’m all for sidewalk cafe spaces that properly compromise with the available public space, but I have to say I agree that the Joint’s Newport section looks and feels too far into the sidewalk, where it bottlenecks twice, once at the lamp post and again at that little green cage assembly. Now, I don’t know if those bottlenecks, especially, are out of code compliance discussed above, as well as any of the rest of the section(s), but I suspect at least the bottlenecks are (and other Rag articles and comments have likely laid out the numbers). Do I think that the public thoroughfare severely suffers these smallish impingements? Not necessarily, even if Newport is a higher volume walk, generally, but more likely for peak volume like Farmer’s Market Wednesdays. And I do think overall that the question and perception also fairly hinges on the fact that for the possible non-compliant Newport impingements all Joint is actually using the space for is a single tabletop (as I’ve witnessed consistently daytime, a single table, often empty). An out of cold impingement does not seem worth or well-designed as a single table. I have a bigger problem with the nail salon and Subway flag signs. More frequently in the way, tacky and far uglier. Aha, thanks for the additional Joint info. Yeah, I’ve had the same thought about giant tacky shop flags obstructing sidewalk space, too, especially when walking past that Subway location. Doesn’t matter. The fact that they have a fence on a sidewalk will never get me to eat there ever again. I personally like the outdoor space, but I wish The Joint would take ownership in smoothing out the sidewalk outside the fence, by the tree on Cable. Mainly, the level sidewalk is now inaccessible behind the fence but the 5 feet remaining for pedestrians is uneven due to the tree roots. Although it might be sufficient clearance per code, with the lifted up sidewalk, it actually only leaves about 2 feet of level walking space. I’ve regularly have to to navigate a stroller there and I feel relegated to a tiny stretch to get by. I imagine it’s much ore difficult in a wheelchair or electric chair, and would be a neighborly gesture to repair. Code Enforcement should have been on that; not any other city organization. And as it is now, The Joint doesn’t need a railing anymore, either. The later rule is that a biz can use up to five feet of sidewalk for seating, if there is another three feet of usable walk available. This is one more fine example of city not knowing one end from another and whoever told The Joint to install a railing should have been brought up to speed on the new rules. Please post the code or a link to it. Three feet sounds very narrow. Sidewalk cafe ordinance requires 5′ width of paved sidewalk. PROW (public right of way) program requires 4′. But to fall under PROW, you can’t have railings or alcohol.